Bijapur, a medieval Muslim walled city, 530 km north-west of Bangalore, is characterised by domes and minarets. 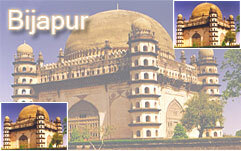 Its founder called it Vijayapura or Bijapur, the city of victory. Bijapur capital of the Adil Shahi kings, experienced a great deal of architectural activity under the Adil Shahi dynasty between 10th and 11th centuries. The Adil Shahis encouraged building activities to such an extent that Bijapur itself has over 50 mosques, more than 20 tombs and a number of palaces. Famous as the 'Cradle of Indian Temple Architecture', Aihole has over 125 temples all intricately carved and rich in detail. The oldest temple here, is perhaps the 5th century Lad Khan Temple. The Durga (fort) Temple has a semicircular apse and a complete portico. The Hutchmalli Temple, the Ravalphadi Cave Temple, the Konti Temple Complex, the Uma Maheshwari Temple, the Jain Meguthi Temple and the two-storeyed Buddhist temple are the other attractions at Aihole. It Contains the mausoleum tomb of the Mahammed Adil Shahi (1626-56 AD), the seventh ruler of dynasty, and is the fourth largest dome in the world. This has the floor area of 1700 sq.m, a height of 51 m. and diameter 37 m. The walls are three meter thick. The interior of the dome, mysteriously unsupported, has a whispering gallery, where the sound returns to the listener nine times. Even the tick of the watch of the rustle of paper can be heard across a distance of 37m in the whispering gallery. Set in its own walled compound less than1 km west of the ramparts, the Ibrahim Rauza represents the high watermark of Bijapuri architecture. Rauza literally means a garden. the square enclosure consists of 2 buildings, one housing the tombs of Ibrahim Adil Shah II & his family & the other a mosque. 1 Km, this finely wrought gateway to the mosque is an excellent example of the Indo-Saracenic style of architecture. It is embellished by a profusion of carvings in the form of brackets supporting the balconies & stone trellis work in Hindu Style. 5 Km, this unfinished mausoleum of Ali Adil Shah, if completed, might have surpassed all others of its kind. Its 12 graceful arches which give it the name Bara Kaman, makes one feel the power of time & death. Built between 1557 and 1686, it is still used for worship. It is believed to be one of the first mosques in India and holds an exquisite copy of the Koran written in gold letters. 1 Km, the great tank commemorates Ibrahim II 's first wife Taj Sultana. Its front is a majestic arch flanked by 2 octagonal towers, the east & west wings of the towers form spacious rest houses. Constructed by Mahammed Adil Shahi in 1646 to serve as a hall for justice. The Mahal contains some relics of prophet Mahammed. Royal Palace constructed by Ali Adil Shahi in 1561. There are three magnificent arches, the central one being the widest. The ground floor was the Durbar Hall and the first floor is the private residence of the royal family. There is a museum maintained by the Archaeological Survey of India in front of the Gol Gumbaz. It contains stone sculptures, inscriptions, manuscripts, arms & weapons, chinaware, wood carvings & carpets. By Air : The nearest airport is Hyderabad (375 Kms) which is connected to all major cities of India. In Karnataka, Bangalore is the Airport, which we recommend. By Train : Bijapur is connected by Rail with Bangalore , Mumbai (via Sholapur), Hospet (via Gadag) and Vasco da Gama (via Hubli and Londa).